It’s about to show some films, which deal with contemporary Russian reality and get a view of current status of different parts of everyday and social life and their conflicts. 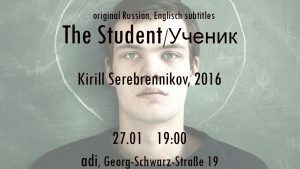 The Student (Russian: Ученик, translit. Uchenik) is a 2016 Russian drama film based on Marius von Mayenburg’s play Märtyrer. The plot revolves around a young man who has become a religious fanatic and gradually drags his surroundings and the whole school into obscurantism, which ultimately leads to disaster. Vorheriger BeitragMY BODY MY CHOICE – SPD-Abgeordnete anschreibenNächster BeitragPolizeigesetz stoppen – Grundrechte verteidigen!